The world's bookstore has become Jeff Bezos' playhouse. Amazon has pulled all the titles from MacMillan, one of the world's largest publishers, from its on-line store, for both print and electronic editions. Amazon.com started out selling books, and has become wildly successful. 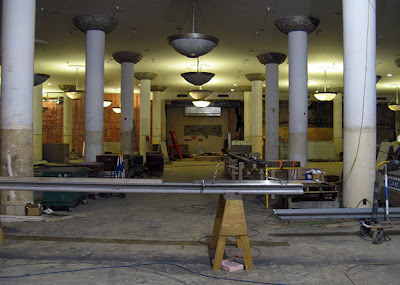 Not long ago, there were at least six major bookstores in and around Water Tower Place. Now there is one, the huge Borders on Michigan. Independent booksellers have been decimated. 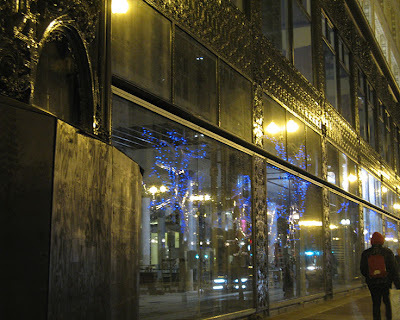 Just last year saw the closure of both the Prairie Avenue Bookshop and Powell's on Wabash. Book-selling is dominated by two major chains - Borders and Barnes & Noble, both so iffy profit-wise that a merger between the two has long been rumored. Electronic books are the coming thing, and Amazon's Kindle has had a 60% market share. Last week, Apple announced its iPad device, which, at price points not that far above the Kindle, offer not only books, but browsing, mail and access to 100,000+ iPhone apps. It has also struck deals with major publishers, including MacMillan, with more flexible price points than those offered by Amazon. Amazon responded by yanking all of MacMillan's titles from Amazon.com. In a span of a few short years, it's gone from being the scrappy underdog, the bookbuyer's best friend, to a bullying monopolist on the model of Microsoft. And if you have any doubts about the monopolist part, check out this post by author Charles Stross. Amazon is no longer content to sell publisher's books. It now demands that publishers wanted to offer Kindle editions must sign over their most basic rights and make Amazon the publisher of the electronic edition. author -> publisher -> wholesaler -> bookstore -> consumer. author -> publisher -> fixed-price distributor -> reader. Amazon charges publishers as if the change never occured - 70%. Apple, recognizing the new business model, is asking only 30%. you have to agree that Amazon is a publisher, license your rights to Amazon to publish through the Kindle platform, guarantee that you will not allow other ebook editions to sell for less than the Kindle price, and let Amazon set that price, with a ceiling of $9.99. In other words, Amazon chooses how much to pay you, while using your books to undercut any possible rivals (including the paper editions you still sell). It shouldn't surprise anyone that the major publishers don't think very highly of this offer ..
Another report, from the Los Angeles Times, here. The first skirmish is over, and Amazon blinked. It's agreed to variable pricing for MacMillan titles - which in this case means higher e-book prices from $12.99 to $14.99 - and restored them to their store. On Saturday, February 20th the Chicago outpost of PechaKucha, which showcases architects, designers and other artists making presentations using 20 slides projected 20 seconds each, will take part in a PechaKucha Global Day for Haiti, a continuous 24 hours of presentations beginning in Tokyo and moving eastward. Crossing all times zones and cultures, the event will be streamed live online and then finish in Tokyo the following day. Here in Chicago, and around the world, presentations are being prepared - some are intended to offer hope and encouragement through stories of past disaster relief projects, while others offer simple inspiration by showing the power of great creative thinking. Some amazing people have stepped up to the challenge so prepared to be surprised. Chicago PechaKucha organizer Peter Exley says invitations have gone out for what promises to be an outstanding roster of local presenters, who will be part of 2,000 presenters worldwide. All the day's proceeds will go to the Haiti rebuilding efforts of Architecture for Humanity, which was also instrumental in getting rebuilding up quickly after Hurricane Katrina and the 2004 Indian Ocean Tsunami. 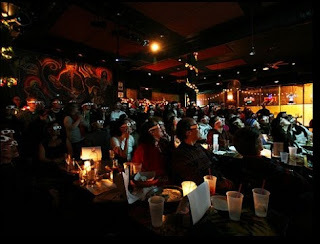 The February 20th Chicago event will be at PechaKucha's usual stomping ground, Martyrs' at 3855 N. Lincoln. Because the event takes place in the afternoon, at 2:00 p.m., it's a rare all-ages PechaKucha, an opportunity for those too young to get into bars and too honest to fake an I.D. to take in one of these always fun, informative and engaging events. Call 800-594-8499 for tickets. 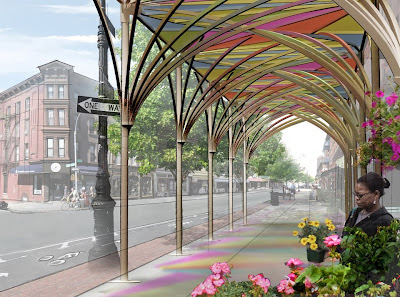 Earlier this week, we wrote about the winning design from New York City's urbanShed competition to come up with alternatives to the often unsightly protective scaffolding that crowd sidewalks around construction sites. We've already heard from a local scaffolding company expressing skepticism that - New York City's claims notwithstanding - the winning design could be executed for anywhere near what the company says is an industry standard of about $150.00 per linear foot for the type of scaffolding currently in use. Now Jim Peters of Landmarks Illinois has reminded me about a remarkable beast-to-beauty story of bad scaffolding gone good. In the fall of 2008, in a piece titled Uncle Sam: State Street Slumlord, I wrote about a truly despicable scaffolding job done on a federal government-owned building: Holabird & Roche's 1916 Century Building, at 202 South State Street, which at street level had been transformed into a dark, dank tomb sided with raw plywood in derelict applique. Flash forward to last summer, and the situation had changed entirely. Instead of the usual pipe-frame tunnel, the sleek, curving steel canopy protecting pedestrians from the crumbling terra cotta above is actually cantilevered from columns set close to the building. Set at a two-story height, it becomes almost invisible, leaving both daylight and free pedestrian movement unobstructed, and giving a clear view of the repaired and polished metal window frames of the elegant 1951 Art Moderne remodeling of the Century's entry floor. Not quite so invisible are the intense graphic coverings, which actually reflect patterns in the original 1915 neo-Manueline Portuguese Gothic-styled terra cotta ornament climbing up the original, thin tower above. The quality of the scaffolding's design is especially important, because the up-in-the-air status of the building may keep it in place for quite some time. It's part of the 1.3 acre parcel just east of the Mies van der Rohe Dirksen Federal Building that includes everything else on the block except for the buildings housing the Berghoff Restaurant. 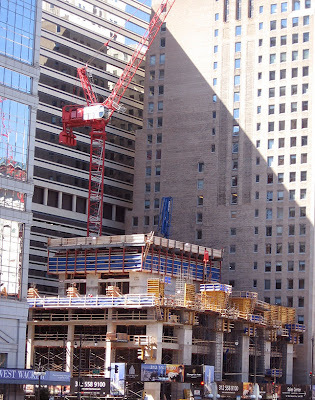 The structures were acquired in 2005 for what is called the Chicago Federal Center Expansion Site, actually a post 9-11 cordon sanitaire for the existing federal properties. In a report you can download here courtesy Chicago Carless's Mike Doyle, the General Services Administration executed an ambitious survey of possible uses for the parcel that range all the way from . . .
. . . an infill tower between the Century and Mundie and Jensen's 1913 Consumers Building to the South . . . 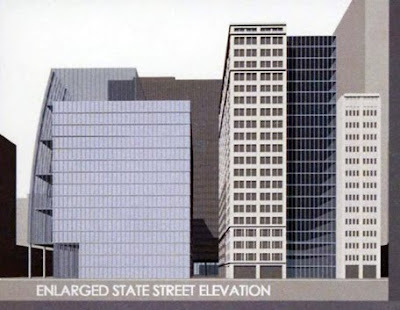 Recently, the GSA has commissioned exhaustive Building Preservation Plans, done under the direction of Johnson•Lasky Architects, for both the Century and the Consumers, as well as for 230 S. State Street. Long overshadowed by its use as a McDonald's, 230 S. State is actually a structure designed by Alfred S. Alschuler for clothier Benson Rixson in what was, for 1937 State Street, a daring Art Moderne style, with a streamlined curving facade and seamless bands of glass block window that at night set the building aglow, as you can see in this Hedrich Blessing photo from the Chicago History Museum. It's one of a generous number of illustrations that document each of the reports. 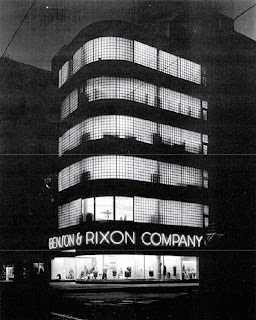 You can see Benson Rixson's striking interiors and elegant, now hidden stair, just as in the Century report, you can get a feel both for both Holabird & Roche's original 1915 design, and the equally excellent 1951 remodeling. It's a reminder of what wonders can lie behind the dark, crumbling profiles of trophy buildings of times past, which we often walk past never taking the time to see. 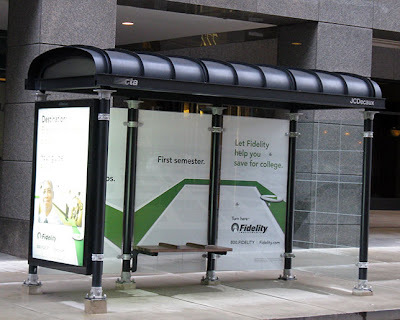 OK, those ubiquitous bus shelters designed by architect Robert Stern may not be the worst thing in the world, although their thick limbs and heavy lids seem a long way from Parisian grace, much less good Chicago design. 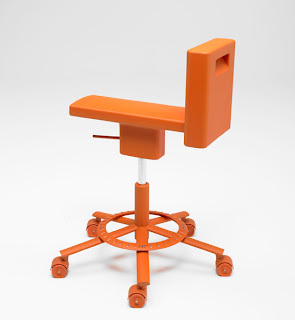 Now the Chicago Chapter of Architecture for Humanity is holding what promises to be a bit more democratic Street Furniture Competition for the design of "one or more pieces of 'street furniture' that can be easily distributed to vacant sites and parks throughout the city for two months during the summer." The fabric of any city has pockets of underutilized and neglected spaces. These vacant pieces of the city are often intended for development at some point in the future but currently sit empty and unused. Left unattended, they can become dangerous and unwelcoming areas along the streetscape. Through small acts of community we can repurpose these empty spaces and imagine for ourselves a better streetscape. The rules are pretty simple: two 11 x 17 boards as PDF's, with "with at a minimum a plan, section/elevation and design detail. Please list the required materials and provide a narrative that describes the following: build process, materials, estimated cost, and end of use/deconstruction plan. Scale of drawings at the discretion of the entrants." As far as I can tell, you don't even have to figure out where the advertising will go, or come up with prospects for the leasing. Deadline is 5:00 p.m., February 26th, with the winners to be announced at AFH Chgicago's March meeting. and a series of "Saturday Build Days" in April and May to infiltrate the winning entries into the city's parks. Questions and final PDFs to submitted via email. You can view the brief as an on-line pdf. 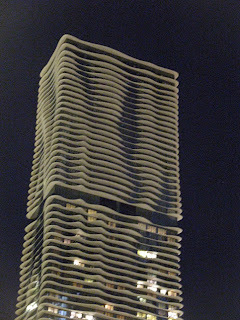 Is this the best joke in Chicago architecture? By all accounts, engineer and architect William Lebaron Jenney was an engaging raconteur. 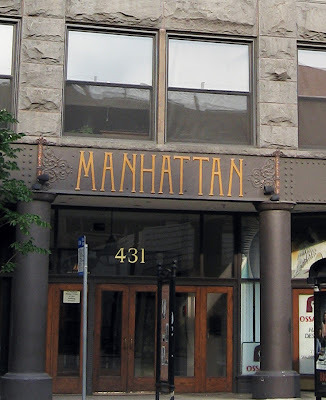 Whether his design of the Manhattan Building, on Dearborn just north of Congress, was a simple matter of casual practicality or an intentional - if private - jest, we'll never know. 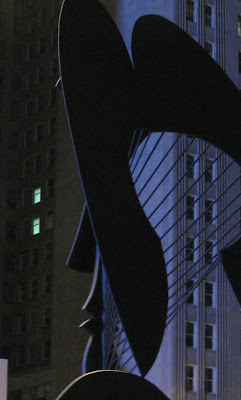 Still, the fact that for what was, at its completion, the tallest building in the world, Jenney gave his steel framed structure an impression of solidity through brick and rough-cut stone, only to give the game away at entry level, with razor thin facades of metal and glass, never fails to make me smile. Jenney may not have been a truly great architect - Louis Sullivan, among others, didn't consider him an architect at all - but he was one of the seminal figures in the flowering of Chicago architecture, and one of the city's great characters, to boot. Read the profile I did of Jenney a few years ago, at the time of the unveiling of a memorial at Graceland Cemetery - along with plenty of pictures - here. 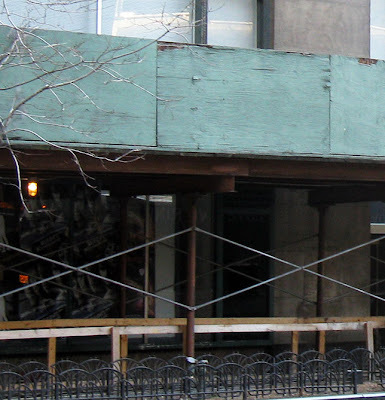 Scaffolds slum up Chicago streets: has NYC found a better way? 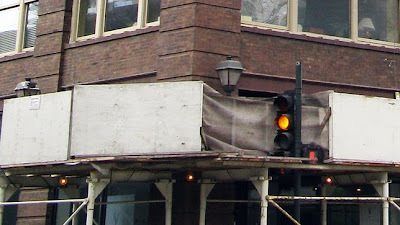 At times during the past decade, especially after falling terra cotta led the city to make building owners step up facade inspections and repair, it seemed as if half the sidewalks in downtown Chicago were covered in ugly scaffolding, forcing pedestrians through dark cages of metal bracing topped off by cheaply painted plywood. Because they're often in place for years at a time, many become derelict presences, with flapping plastic and cracked, peeling paint. As necessary as they may be, scaffolds slum up streetscapes and cheapen the experience of the city, often in a way not even a crumbling building can match. 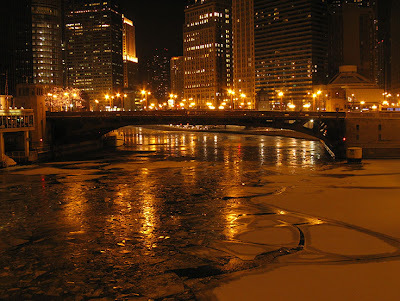 "Walking on the sidewalk shouldn't be an ominous adventure, but it is." 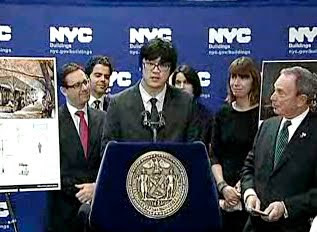 Those were the words of New York City Planning Comissioner Amanda Burden at a press conference this past Thursday unveiling the winner of the urbanShed international design competition "to conceptualize a cutting-edge sidewalk shed to protect pedestrians, improve the pedestrian experience– and make New York City even more attractive for generations to come." Sidewalk sheds are what we just call scaffolding. 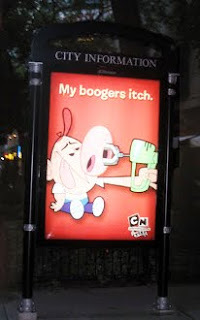 There are more than 6,000 of them in New York City, spanning in excess of a million linear feet. On one prominent street, 30% of the sidewalks were covered. The competition received 164 submissions from 28 countries. The blue ribbon jury included not only Burden, but also NYC Buildings Commissioners Robert D. LiMandri and architects David Childs, Ada Tolla, Jean Oei and Craig Dykers, among others. Brief requirements included the ability to support a minimum of 300 pounds per square foot, sustainable materials, graffiti-resistant, and economical in both installation and maintenance. You can see all three finalist entries here. The winning entry in the competition came from Young-Hwan Choi, a 28 year old student from t he University of Pennsylvania School of Design, who received $10,000. 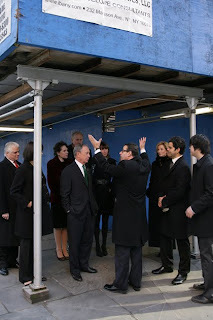 At Thursday's press conference, New York mayor Michael Bloomberg claimed that the cost for installing Choi's design will be no more than that for current sheds, with maintenance costs actually being lower. The use of the design will not be mandated, but Bloomberg expected it would be adopted because of the advantage to store owners. Currently, "When a shed goes up on the sidewalk, it hurts their business." Choi's design not only is a major improvement aesthetically, but it eliminates the gloom of current sheds by bringing in much more light, and makes navigating around the scaffolding much less onerous. "No cross members to block you," said Bloomberg. 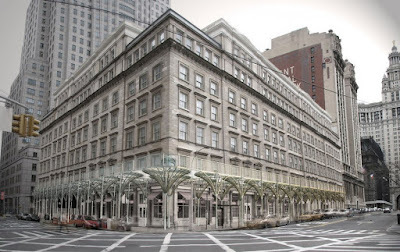 The Alliance for Downtown New York will bankroll the installation of a full-scale prototype at a landmarked 1846 building at 280 Broadway in lower Manhattan that was originally the "Marble Palace", the A.T. Stewart store often cited as the first department store in the United States. Later the structure became the home to both the New York Sun and A.T. Stewart department store.construction site in Lower Manhattan. Currently, the building is city-owned, housing the Buildings Department. Back in Chicago, with the winding up of the last great construction boom, our own supply of sidewalk sheds appears, thankfully, to be in decline. 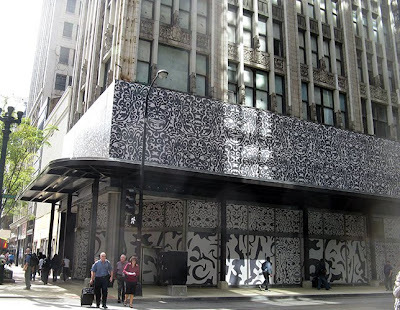 A good time to take a long, hard look at Chicago's ugly scaffolds, and at the urbanShed competition. 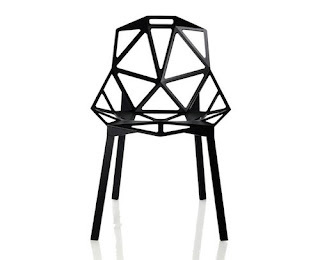 Will Choi's design work as advertised, at the promised cost? 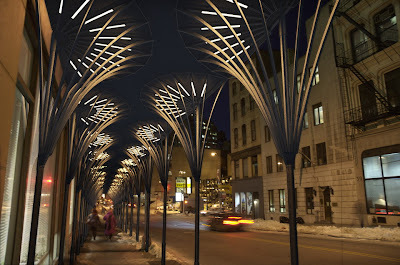 Let's call on Chicago's own architects and designers to come up with alternatives that can avoid turning the city's streets into dark, dispiriting dungeons the next time construction revives. If Frank Gehry designed a stone house . 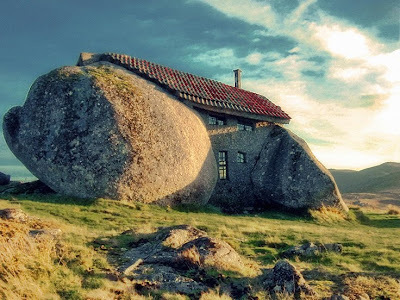 . .
house in Portugal, courtesy Jsome1 on Flickr. 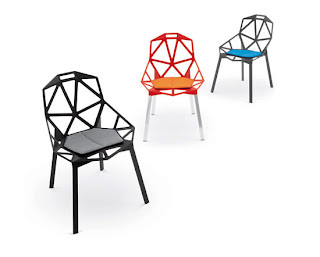 The Munich-based designer has made a career out of synthesizing the minimalism of modern design with a distinctive expressive sensibility through the use of color, form and material. His work is a bit more restrained than that of Ettore Sottsass, a key influence, but it also brings wit - and a bit of panache - to utilitarian objects, including a coat hanger with its own brush. As noted by curator Zoë Ryan in her excellent catalogue, Grcic's wine rack seems an updating of a Duchamp readymade, as well as "a tongue-in-check response to the emphasis on recycling . . ." Wanda's (that's the racks name) vertical design is actually more functional than horizontal racks that wind up being a collection of "precarious stacks"
An artist most at home with drawing - although he's more recently come to computer design - his work, everything from pens to pottery, with the usual chairs and tables in between, is both visually bold and every-day serviceable. 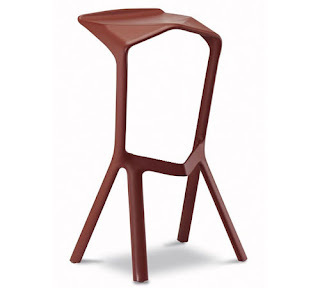 Works like the cement base Chair One , with its uncushioned wireframe, are surprisingly comfortable, as is Grcic's Miura barstool, which at first glance looks like the kind of perch you'd find in a sadistic doctor's office, but, in use, provides an entirely agreeable support. I can say this because one of the great things about the show is that Ryan has arranged Grcic's work all around a central seating area in which visitors are actually encouraged to try out Grcic's designs for themselves, including his 360° chair, a colorful stool-chair hybrid that, again, looks a bit precarious but is actually quite stable and very suitable for people whose requires them to move around both through and around their workspace. 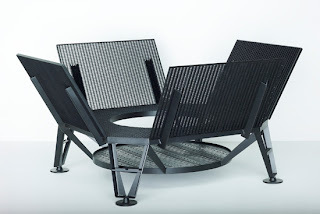 The "central zone" area "reflects Grcic’s long-standing interest in Formula 1 racing" and its perimeter is formed by a continuous row of seats consisting of two tires topped by a wooden platform. 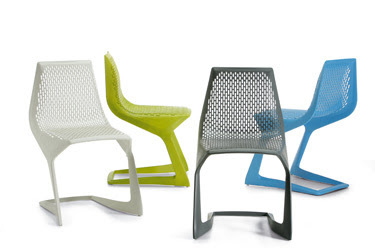 When you sit on one, it has the same slight give as a cushy chair. If you haven't seen it, do try to catch this show before it closes this Sunday. Grcic's interview with Interview. More photos of his work, and a monograph on KGID. And a podcast of Grcic discussing his work. Grcic on YouTube fielding frequently inane questions with intelligent answers. Another interview, minus the hyperactive wrapper, here. I really have to get out more. 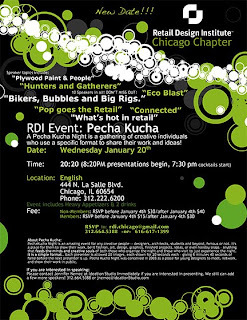 Tonight, January 20th, architect Stephen Wierzbowski will making a presentation, Bikers, Bubbles and Bigs Rigs, at a special Pecha Kucha Night presentation sponsored by the Retail Design Institute Chicago Chapter at English Bar, 444 North LaSalle, beginning at 7:30 p.m.. Each presentation must be made with 20 images shown for 20 seconds each. The bad news is it's $30.00 for members, $40.00 for non-members. The good news is the charges include "heavy appetizers" and two drinks. RSVP via email or at 312/664.5388 or 616/617.1399. Rich, founder and chair of Brooklyn-based CUP, the Center for Urban Pedagogy, which brings together artists, graphic designers, architects and urban planners with community-based advocates and researchers to create educational projects "about places and how they change" The lecture is at 6:00 p.m., at the Graham's home, Madlener House, 4 West Burton Place. You can also take in the Graham's current exhibition, ACTIONS: What You Can do With the City, before the talk. RSVP via email. 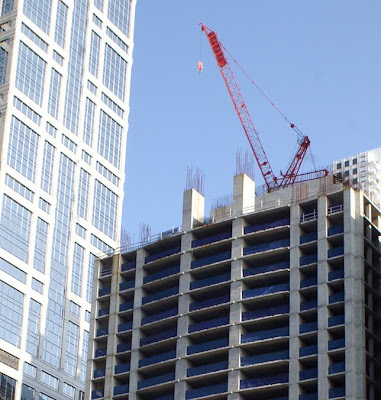 The Chicago-based Council on Tall Buildings and Urban Habitat releaed on Monday its annual survey of skyscraper construction. 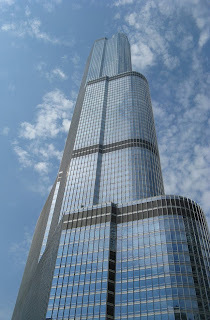 Three of the five tallest new buildings were in the U.S., with 2009's world's tallest being the SOM/Adrian Smith Trump International Hotel and Tower, at 1389 feet. 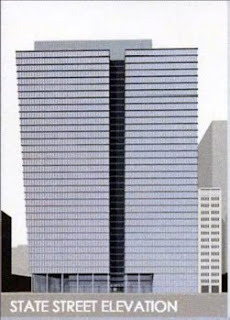 Second is New York's Bank of American Tower, at 1189 feet, third, Beijing's China World Trade Center III, at 1083, fourth, Arraya Center Office Tower in Kuwait City (984), and fifth, Studio/Gang's Aqua, at 858 feet. Five of the top ten were in China, two in the Middle East, none in Europe. The only two using steel construction were by SOM. Make up your own discussion on the questions of quantity and quality. Overall, there were 38 buildings completed in 2009 with a height of 200 meters (656 feet) or over, down from 53 in 2008. In 2000, there were 267 structures over 200m, by the end of 2010, 643. Over 250 are in the pipeline for the next three years, with over a hundred to be completed in 2010 alone. After that, we'll see. My bet is that the Burj Khalifa's record of 2717 feet will be safe for a while. They orient themselves in a number of ways. They figure out where they are by smell, by recognising the name of the station from the recorded announcer’s voice and by time intervals. If, for example, you come every Monday and feed a dog, that dog will know when it’s Monday and the hour to expect you, based on their sense of time intervals from their biological clocks. 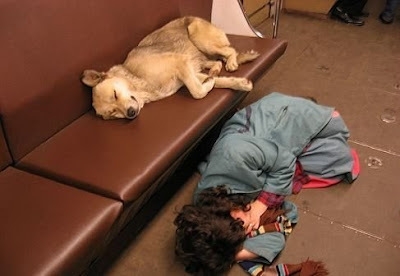 The strays are considered beyond domestication, and scientists are speculating that, over time, they are reverting to a more wild, wolf-like state. Even so, they've developed a way to co-exist with the city's two-legged inhabitants and their environment. Read Sternthal's intriguing story, complete with striking photographs, here. For more, here are articles from the Wall Street Journal, and the website English Russia. Elsewhere in the FT, Andrew Clark has lunch with period instrument conductor and gentleman farmer John Eliot Gardiner. Also this weekend, Los Angeles Times architecture critic Christopher Hawthorne has a rather meandering article on Jeanne Gang, Aqua, women in architecture, Viagra, testosterone, and Bob Stern on why there are fewer women architects because they get distracted by having children. It's a tricky topic, but I have to be honest with you: I think my piece from four years ago, Designing Women, is a bit more focused than Hawthorne's. 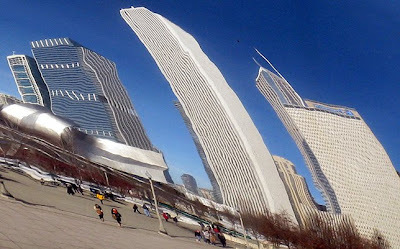 Feminine/masculine in architecture is certainly a valid, important - and fascinating - topic, but, at least in this case, I come down on the side of Stanley Tigerman's way of looking at it: "Jeanne Gang is a god-damn good architect. Period." It all started out so bright and innocent, nearly four years ago, as the huge, fire engine red crane was constructed above the concrete core, a bright, wireframe cherub reaching high to full extension as it began to raise the Waterview Tower two and a half city blocks into Chicago's skyline, creating a new Shangri-La (the tower's hotel client), promising a place of grace and beauty. 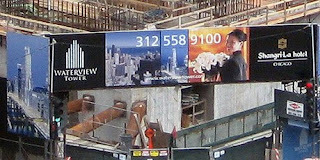 Chicago architecture and engineering firm Teng & Associates had decided to jump start the project with its own money. Like Garrett Kelleher and Shelbourne Development's Calatrava Spire, they took the rare and risky step of starting construction without having financing in place. Two years later, in mid-2008, the giant crane was arrested in its ascent at the 25th floor as the project, itself, staggered into the 25th hour. The money had run dry. Construction ground to a halt. And there the great crane has remained stranded above three stories of rust-strained core, topped with a crewcut of exposed reinforcing rods like rows of pigeon spikes. Until now. 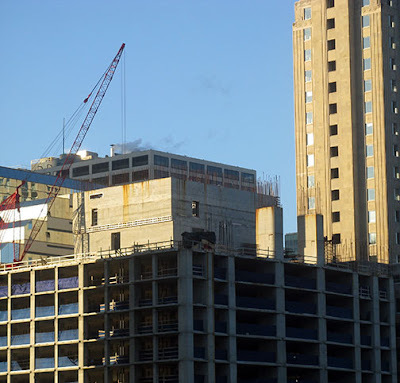 Marina City News has an excellent article on the deconstruction of the mighty Waterview crane, done by the erection of another, smaller crane. Early in 2009, the Circuit Court had declared the Waterview an abandoned property, after hopes of a $340 million cash infusion and takeover by a Chinese corporation fell through the year before. Central Crane Rental Service and Adjustable Forms, who both hold liens against the property, agreed to spend a reported $800,000 to dismantle the crane. 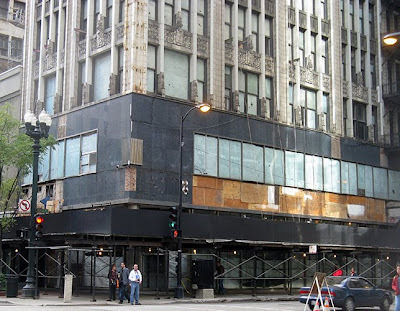 The Chicago Sun-Times' David Roeder is reporting that the building has a negative $15,000,000 net worth. 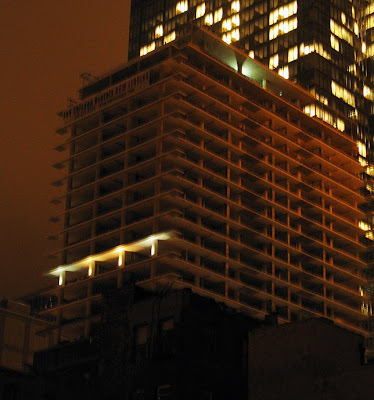 It's now our own Lost Horizon, one of the two great memorials to Chicago's ought decade housing bubble. 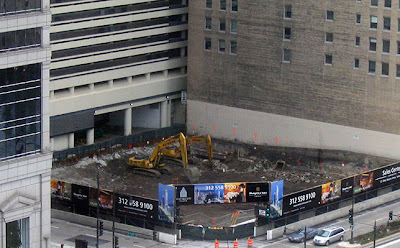 The Spire, concave, is a hole in the ground. Waterview, convex, is a 25-story concrete shell, a tombstone for the death of developer exuberance, irrational and otherwise. For better or worse, it's one of the most distinctive structures in the city. What now? What should we do with it? Leave it rot, as a warning? Turn it into a parking garage? Aviary? Municipal mausoleum? Have Tracey Dear create a night time lighting scheme for it? 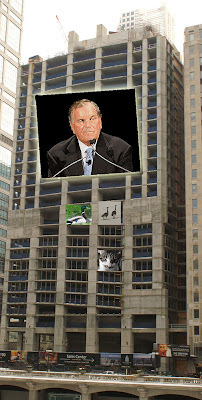 Use it to mount the world's largest video screen from which Mayor Daley can make his pronouncements to the city? An eco casino? A childrens museum? Maybe we should have a competition. 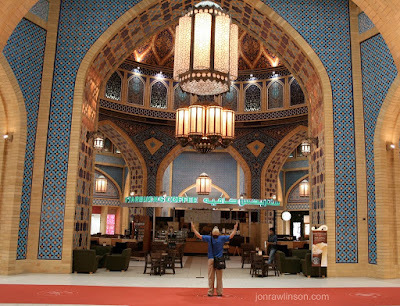 Louis Sullivan restored to splendor. 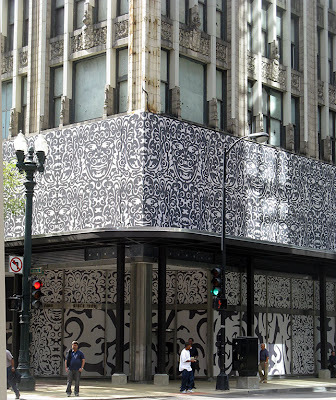 Louis Sullivan stripped and forlorn. All this could be yours. 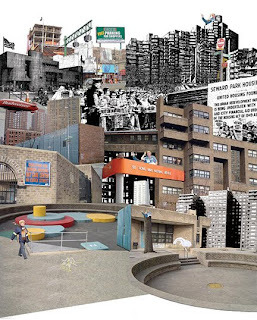 The originally proposed digital art for Block 37 was value engineered out years ago. 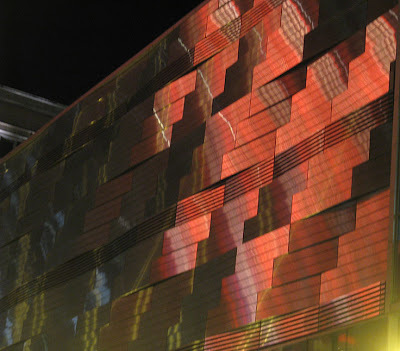 Now the only animation of the weave metal facade comes from the other side of the street. taking on ice . 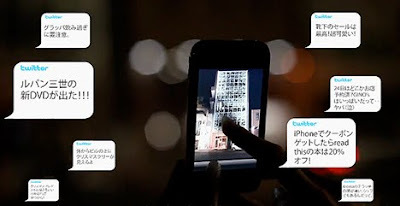 . .
A new Tokyo building lets you read the thoughts of its inhabitants from its facade. Its innovative, cool, and a little frightening, all at the same time. 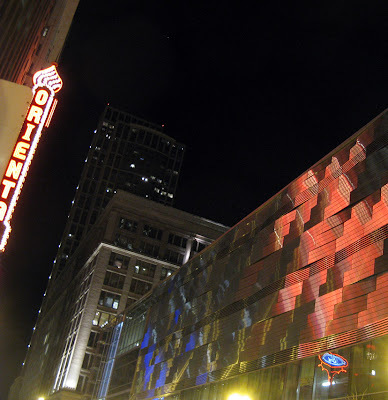 Read - and see the photos and movies - about how Teradadesign Architects and Qosmo Inc. are infusing structure with social media and merging architecture with technology in ways Mies could never have imagined, here. Think the Burj Khalifa is Something? You haven't seen the Starbucks!